"Beginning of the school year in the courtyard of the minor seminary"
Group photo for the opening of the school year 1933-1934 in the courtyard of the minor seminary. 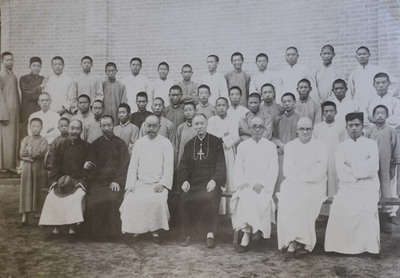 “John-Baptist Wang, the new rector of the seminary, is a gem.” Front row, third from left, Fr. John-Baptist 王增義, rector; fourth: Bp. Sun Dezhen 孫德楨 sixth: Fr. Raymond de Jaegher; the seminarians are behind them. Beginning of the school year in the courtyard of the minor seminary. 1933. Société des Auxiliaires des Missions (SAM) China Photograph Collection, Whitworth University Library, Spokane.